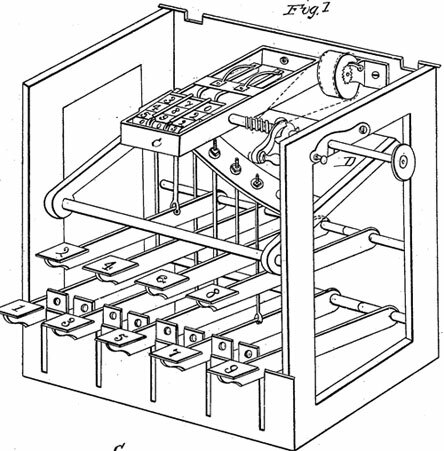 On 17 August 1858 the machinist from Alton, Illinois, Leonard N. Nutz, received a patent (US patent №21236) for a single column adding device, which seems to be the fourth in the USA keyboard adder, after the machines of Du Bois D. Parmelee, Orlando Lane Castle and Thomas Hill, and seventh in the world, after the machines of James White, Torchi and Schwilgué. The patent of Nutz was assigned to Irwin Blackman Randle (1811-1893, an Alton lawyer) and Elias Hibbard (1795-1873, a wealthy Alton businessman), who obviously ordered the device to Nutz. Interestingly enough, Orlando Lane Castle, who received his first patent only several months before Nutz (in November 1857), also lived in Alton (Mark Twain once referred to Alton as a "dismal little river town"). It's hard to believe, that living in this little town (in 1850s Alton's population was between 4000 and 5000 people) Castle and Nutz didn't know each other and didn't share their ideas, although the construction of the Castle's machine is quite different, compared with the calculator of Nutz. Besides the patent, nothing is known about the machine of Nutz, so probably it remained only on paper and the assignors (Randle and Hibbard) didn't manage to setup its production. Even the original U.S. Patent Model (up to 1880, the Patent Office required inventors to submit a model with their patent application) seems to be lost or destroyed. So we have no choice, but to examine the calculator of Nutz, using the patent drawing (see the drawing below). The calculator of Nutz is a single-column adding device with a simple, but well designed and reliable construction. The innovative technical solution in the construction is the adjustable shaft fixed by a catch (marked with D in the patent drawing), which actually was the claim of the patent. The shaft has one or more feather-keys thereon for the purpose of clutching and giving motion to the block of the indicator corresponding with the column one wish to add. If for example an addition of several multi digital numbers must be performed, firstly all units must be entered, using the keyboard. Then the catch is lifted from the shaft D and the shaft is pushed in, so as to clutch the block of the indicator of tens. The indicator of tens is then in gear with the keys of the keyboard, and the addition of this column is proceeded with in like manner to that of the column of units. By thus continuing to change the connection between the shaft and the indicators from one corresponding to the column where the addition is completed to the next following, any number of columns may be added up and registered by the use of the same keyboard. The indicators are endless chains passing over two square blocks and numbered from 0 to 9. At intervals of every ten links is a pin for the purpose of operating on a lever, which in turn acts upon another pin on the rear side of the next indicator and moves it forward one link for every ten links, that indicator the next preceding has been moved. Who was the machinist and inventor Leonard N. Nutz? 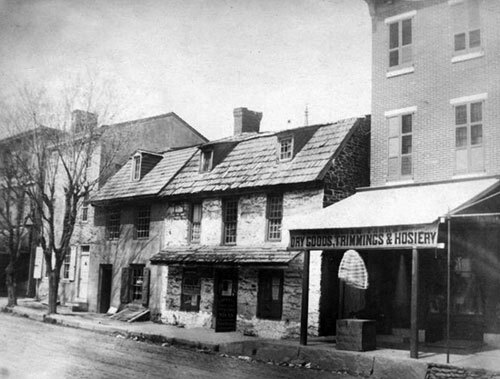 Leonard Nice Nutz (named after his grandfather, Leonard Nutz Sr.) was born on 14 October 1810, probably in the house of his grandfather (pictured below) in Germantown (nowadays part of city of Philadelphia, Pennsylvania). His parents were William Nutz (b. 23 Nov. 1777) from Germantown, and Susannah Nice (b. 1781–d. 2 Sep. 1848) from Nicetown (today also part of city of Philadelphia), who married on 7 Sep. 1803 in Germantown, and had 2 children: Leonard Nice and William Nice. Notes: "A very old stone house, of two storys, owned and dwelt in by Nutz, a tanner, who had his tanyard along the street, southward. It is now a house resting some two feet or more below the street pavement but in former years (before the turnpike was laid there at a higher grade)... It had two steps upwards of entrance form the street. It was originally the Van de Waestyne House... On the Main Street of Germantown - on the north side of the street, between Shoemaker and Mill street". 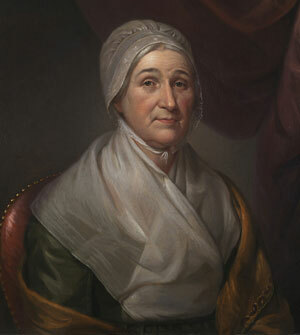 William Nutz and his younger brother John worked as tanners with their father— Leonard Nutz Sr., who was one of the wealthiest people in Germantown, and a nice portrait of his wife Margaretha (Keyser) Nutz (1748-1812) is kept in Philadelphia Museum of Art (see below). They had 7 children: Elizabeth (b. 1769), Sarah (b. 1771), Christianna (b. 1774), Leonard (b. 1775), William (b. 1777), and John (b. 1779). Leonard Nice Nutz was married twice. In 1836 he married in Clermont, Ohio, to Rebecca Clutch (1812-1845). Their children were Susanna Nice (1837-1920), William (b. 1838), Francis Johnston (1840-1887), Leonard McDonald (b. 1842), and Rebecca (1843-1846). On 27 November 1846, a year after the death of his first wife Rebecca, Leonard married second time, to Susan Catherine Cochran (1827-1901) from Maysville, Mason Co., KY. Their children were Theodore Marston (1850-1927), Charles (1853-1918), the twins Carrie Belle (1858-1928) and Harry (1858-1885), Mary (b. 1859), George Washington (1861-1910), and Rebecca (died in infancy). Leonard Nutz lived in St. Louis for some 10 years (c. 1847 until 1858) and is listed several times in the St. Louis City Directory; in 1848 he is listed as a machinist, residing at 158 Olive Street. He is next listed in 1851, giving machinist as his trade. In the 1852 Directory Nutz is again listed as a machinist, located at 10 Second Street. In the 1857 Directory Leonard Nutz is listed as a mathematical and philosophical instrument maker. 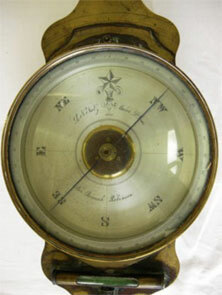 A nice compass (19 inches in length and 8.25 inches in diameter), made by Leonard Nutz for the surveyor Benaiah Robinson in 1853, survived to our time (see the nearby image), and is kept now in the collection of Madison County Historical Society. In 1858 Leonard Nutz moved with his family to Alton, Illinois, where he died on 16 November, 1870. His sons Theodore, Charles and George also became splendid mechanics, made a success in business and became prominent citizens of Alton in their line.